For those of you who don’t pay attention to mailing lists closely… there’s been a request for feedback on standardizing eRCP in OSGi. Yes you read that right, there are people wanting to standardize eRCP in OSGi to help with adoption. There are some large backers for this proposal… Sprint, ProSyst, Nokia, and IBM. What are my thoughts? Well, besides the quirks of reverse-specing something… it seems like a good idea. However, I’m still a bit uneasy with where the control lies… does this specification imply that the OSGi community gets to dictate what is in eRCP from now on? 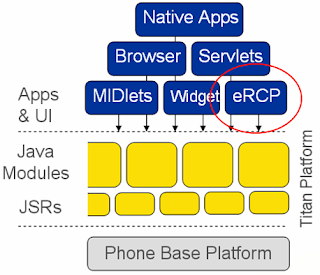 What impact does this have on the RCP stack controlled by the Eclipse community? Does the eRCP project in Eclipse become the reference implementation, similar to how Equinox is the reference implementation for OSGi? Cool stuff… it’s amazing to see the excitement around OSGi and eRCP these days! By the way, I’d look for an official press release soon for the details, but what’s wrong with getting started a bit early :)? What’s that we see in red? Oh my, it’s eRCP, what’s that doing there! People always called me crazy when I told them Eclipse would find its way into your cell phone or PDA, but look, another phone! In Sprint’s case, it looks like the ease of application development, shared services and the ability to do some cool remote management swayed the business case for including OSGi and eRCP within Sprint phones. Have you submitted something to EclipseCon? Where else can you do that? This also traces the evolution of Eclipse from just being some tooling platform to a viable runtime for various types of applications. It’s my hope that the tutorial attendees who went through this track of tutorials would come away that Eclipse isn’t just about tools anymore and that there’s a lot of power in reusing your skills and assets to develop against three different runtime environments. All of this in just one day! Do people think this is a good idea? If so, I’ll see what I can do to make it happen. While reading the Eclipse newsgroups this morning, I came across someone using one of my dirty words. Hrmmm passivation, I wonder what their background is as a developer. Oh, there are some new Eclipse articles out. The first is pretty snazzy article on eJFace which is part of the eRCP project. It’s like JFace, but for more constrained environments. The other article is a simple introduction I did for Eclipse Forms to help spread the word. The next stop on the article train for me is a two-part article series with Benjamin Muskalla about the Rich Ajax Platform (RAP). The first part will be a basic introduction to RAP including some demos, setting up your environment for development and a simple example to work with. The second part will include more advanced topics like theming and creating your own widgets for use within RAP. Look for these articles in a couple weeks to coincide with the launch of RAP! On a side note, I noticed the RAP team posted the famous RCP Mail example as an online demo. I would just like to point people to a bug that I thought was really cool, a Peter Nehrer has prototyped EMF working on a much lower execution environment (meaning, EMF has the possibility to run on devices). Hopefully the EMF team investigates this possibility after the Europa release, it’ll be a cool thing to watch. Forgive me for not posting this bit of news with a direct article link, but I recalled this bit of information from my memory by reading an EclipseCon 2007 talk abstract. At the last Sprint Developer’s Conference, there was mention of Sprint moving to OSGi and possibly using eRCP in their next generation set of devices. In my opinion, this is huge news and just goes to show how OSGi (and Eclipse) is being adopted throughout industry. If anyone has a direct link to an article, that would be great! It looks like we have a comprehensive article on how to use base Eclipse to work with eRCP now. Why should you look at using eRCP? 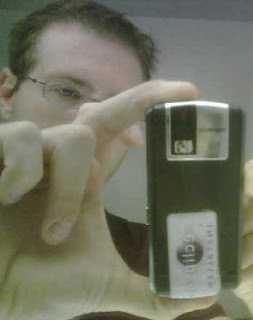 I find reading David Beers’ blog post on ‘Eclipsing Java on Mobile Phones’ helpful. So helpful that I actually want to write a bug against eRCP to include some of that information on their website.